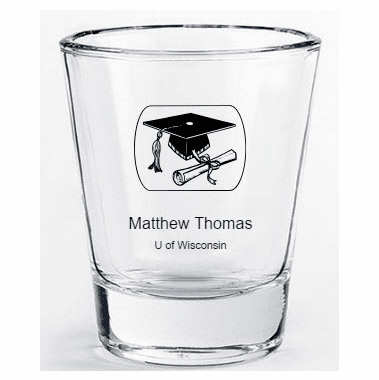 Custom-printed shot glasses as graduation favors will make drinking more fun for your party guests. When you graduate, celebrate this milestone achievement in life by gifting this petite keepsake to all your guests. Each measures 1 7/8" wide and is 2 3/8 tall with a 1 3/4 ounce capacity. 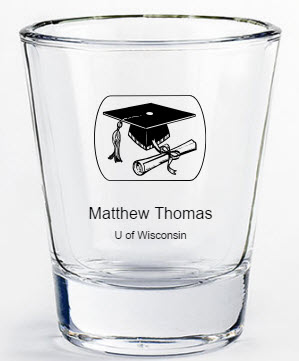 Explore our unique customization options and add your name, year of graduation and message in the colors, font and theme of your choice, and it will serve as a thoughtful memento of your big celebration. Although glasses come bulk packed, you may buy a white window box with a bow for .50 each.